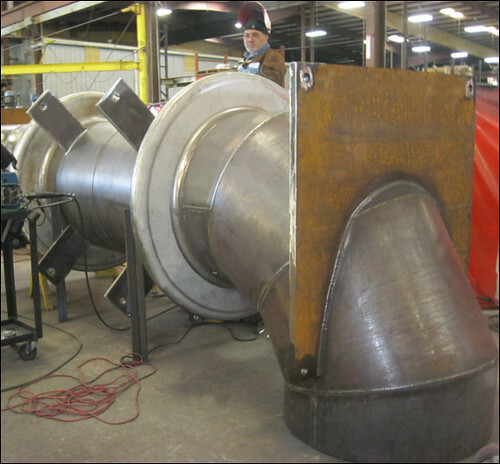 U.S. Bellows custom designed two 42″ tied universal expansion joints, a 42″ hinged expansion joint and a 62″ fabric expansion joint in ductwork for an acid plant in Louisiana. The assemblies had flanged and flued head bellows fabricated from 304H stainless steel. The rest of the assemblies were made from carbon steel with operating temperatures of 700°F at 10 psig. The expansion joints were dye penetrant and x-ray tested prior to shipment. Tie rods are necessary in some applications to continuously restrain the full pressure thrust during normal operation while permitting only lateral deflection. Here is an example of what can happen when tie rods are not specified or the piping has not been anchored. We have an inventory of stock bellows for your quick-turn/emergency requirements. Contact us now if you need a replacement expansion joint. We can run it through our expedited manufacturing line using a prefabbed bellows and get it to you within 1-2 days in some cases. Using our inventory, we can quickly assemble and ship a variety of expansion joints including single, single tied, universal, elbow pressure balanced and in-line pressure balanced expansion joints. Stock bellows are available from 2″ to 24″ diameter and in three pressure values: 85 psig, 150 psig and 300 psig. One of U.S. Bellows’ customer’s existing expansion joint failed and caused a plant shut down. They required an immediate replacement joint. This universal expansion joint order was placed, designed and fabricated in just one day. The order came in at 8:30 am on Saturday, Labor Day weekend and was shipped at 4:00 pm, which minimized the time of the plant shut down. This universal expansion joint is 96″ in overall length, 20″ inside diameter and can absorb 3.25″ lateral movement. A 100% dye-penetration test and a hydro-test were performed to ensure quality. 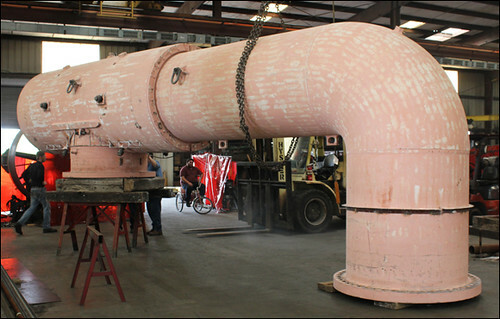 Within a three day span, U.S. Bellows, Inc., fabricated a 40″ I.D., single coded, clam shell expansion joint for a chemical plant in Beaumont, Texas. The chemical company utilized U.S. Bellows’ 24 x 7 Quick Turn/Emergency service. After the representative from the chemical plant completed the online form, the U.S Bellows’ on-call team was immediately paged. 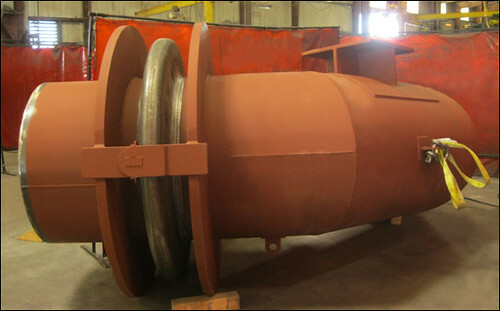 Three days later the bellows had been successfully fabricated, welded to an A516-70 heat exchanger shell and shipped to the chemical plant to resume operation. The bellows was fabricated from A240 tp 321 SS and designed at 50 PSIG and 750°F. In order to detect any leaks in the weld, the bellow’s long seam weld was 100% x-rayed and its attachment weld was 100% dye-penetrant. A Houston-based expansion joint manufacturer, U.S. Bellows, Inc. has acquired all bellows assets of the former Lortz Manufacturing company. This acquisition includes the fabrication equipment, expansion joint and bellows drawings, design software, customer lists, and all engineering history and other historical data associated with Lortz Manufacturing. The expansion joint equipment was transferred from Bakersfield, California to the U.S. Bellows facility in Houston, Texas. The additional machines will be incorporated into the current U.S. Bellows location, and therefore significantly expand U.S. Bellows’ ability to provide high quality expansion joints more quickly and efficiently to customers around the world. U.S. Bellows will be hiring and relocating some of the former Lortz welders and other employees to their manufacturing headquarters in Houston. Besides expansion joints and bellows, the company also offers field services and quick-turn service for emergency situations. U.S. Bellows has over 50 years of experience and is prepared to provide expansion joint repair, refurbishment or replacement for past Lortz-supplied expansion joints. U.S. Bellows, a member of the Expansion Joint Manufacturers Association (EJMA), supplies an assortment of metallic and fabric expansion joints for a wide variety of applications. The unexpected closure of Lortz Manufacturing came as a surprise to us here at U.S. Bellows. For the customers who may have been adversely impacted by the closure of Lortz Manufacturing, we are offering our products and services to you. In case you are unfamiliar with U.S. Bellows, Inc., we have been designing and manufacturing high quality engineered expansion joints since the 1960′s and are located in Houston, TX. We have also been a member of EJMA since 2002 and have representation on both the technical and management committees. From custom metallic expansion joints to a variety of fabric expansion joints, we are bound to have the product you need for your particular application. Rest assured that your expansion joint needs can be covered by our 24/7 web-based emergency services, field services and quick-turn around time when you need it most. Please view our product line and call us at (832) 356-8812 to speak to a U.S. Bellows representative who will help accommodate your specific expansion joint requirements for continued uninterrupted operation in your piping system.